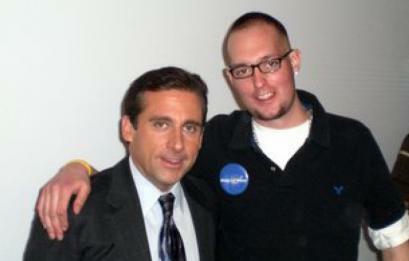 Zachary Carson (right) with actor Steve Carell. When Zachary Carson was diagnosed with an inoperable brain tumor at age 17 and told that his life would be measured in months, his first response was understandable. "I was scared," he said in an interview with an alumni publication of the Landmark School. His second response was somewhat less predictable. "When I think about it, you can look at cancer, cry, and be depressed, or you can take it one day at a time and live for the next day," he said in the interview. "This disease has given me new guidelines and rules. After I found out I was sick, I look at life differently. It is special. I hate having cancer, but it actually impacted my life in a good way. It made my life better." And in turn, he tried to make life better for those who would follow, using his case to help raise about $220,000 for research into diffuse pontine glioma, the rare pediatric cancer with which he had been diagnosed. Mr. Carson, who lived for 27 months after receiving that terrible news from his doctors, died of respiratory failure yesterday in his Newton home. He was 19. Despite the accomplishments in the waning months of his life, Mr. Carson would have been the first to remind anyone who would listen that he intended to live to enjoy the fruit of his labors. "Up until the day before he died he was shopping online, he was planning his life, he was thinking about vacations," said his mother, Roberta. "I think his legacy is his strength, his determination, his courage, his grabbing hold of life and not wanting to let go," said his aunt, Susan Vernick of Lexington. "He just did not want to give up. I think that's the real legacy." Dr. Mark Kieran, director of pediatric neuro-oncology at Children's Hospital and Dana-Farber Cancer Institute, said his patient made a twofold contribution to those diagnosed with diffuse pontine glioma. By participating in experimental treatments, he said, "Zach in fact became one of the longest survivors of this tumor. He had to be willing to let himself be the experiment. This was a kid and a family who said, 'We didn't choose this, but we're going to fight tooth and nail so others won't have to suffer what we've been through.' "
And the Carson family's fund-raising, which included a benefit premiere of Steve Carell's movie "Evan Almighty" in Boston on June 21, contributed to research specifically on diffuse pontine glioma. Rare pediatric cancers, Kieran said, aren't really on the radar screen of major funding agencies. Rather than contributing to the research funding effort, he said, "the things that Zach and his family did are the effort." Mr. Carson had met Carell though the Make-A-Wish Foundation, which arranged for the Carsons to visit the set of Carell's TV show "The Office." "Steve is just the nicest, nicest, nicest person," Roberta Carson said. "Never mind Hollywood nice. He was just a nice person." The family asked whether Carell would help raise money for research, she said, "and Steve moved mountains to make this happen." "It's a great cause, and Zach's a great kid," Carell told the Patriot Ledger of Quincy at the "Evan Almighty" premiere. Born in Boston, Mr. Carson grew up in Newton, and grew quickly, reaching nearly 6-foot-5. "He was just this outgoing huge kid, a head taller than everyone else," his mother said. Mr. Carson, who had difficulty processing language, attended Landmark School in Beverly, which focuses on language-based learning disabilities. He then went to the Forman School in Litchfield, Conn., where he played lacrosse, football, and soccer, graduating last year. "Zach was quite a powerful presence of a person," his mother said. "He bonded with people everywhere we went - all ages, all demographics." "His heart was as big as he was," his aunt said. "And he was a bit of a jokester. He'd get this glint in his eye and a kind of half-smile and you knew you were in serious trouble." Behind the humor was a serious determination to help solve the medical puzzle his brain tumor presented and to simply survive. "I wondered when he was first diagnosed how much he understood about what he was facing," said his grandmother, Lyn Weiner of Newton. "But he took in the entire depth of it and asked piercing questions and kept track of 20 different medicines. He led us in the thought process. He never let us be sad. He was always saying to us, 'Don't cry, I'm fine, I'm going to be fine.' He was a real role model on how one handles illness. I think the most important thing was how people responded to him. They rose with him." Mr. Carson, who attended Lasell College and majored in hospitality, told the Landmark School alumni publication a few months ago, "I want to be the next Donald Trump." "What can I say, I have big goals," he said. "Honestly, I am a very positive person. I'm looking forward to surviving this. This is a little bump in the road. Ten years ago, I would have had less hope. I am going to be the one who makes the breakthrough. I am a special case." In addition to his mother, grandmother, and aunt, Mr. Carson leaves his father, Paul; his brother, Jacob; his maternal grandfather, Ed Weiner of Newton; and his paternal grandparents, Pete and Betty Carson of Berkeley, Calif.
A funeral service will be held at 1:30 p.m. today in Temple Beth Avodah in Newton.